Street food is the life of the city in many places; it’s a quick meal, on the go, cheap and delicious. One of the characteristics of street food is often multitude of ingredients and the balance between them that has been perfected over many years, sometimes generations. In this class we will make our own pita bread, the kind which originated in Yemen. 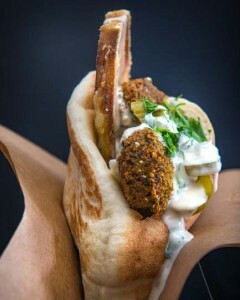 and falafel, baked or fried with all the condiments. If you are looking for a healthy and delicious meal that will energize you for the entire day, come join the class.